This selection would not be complete without a West Country charter. 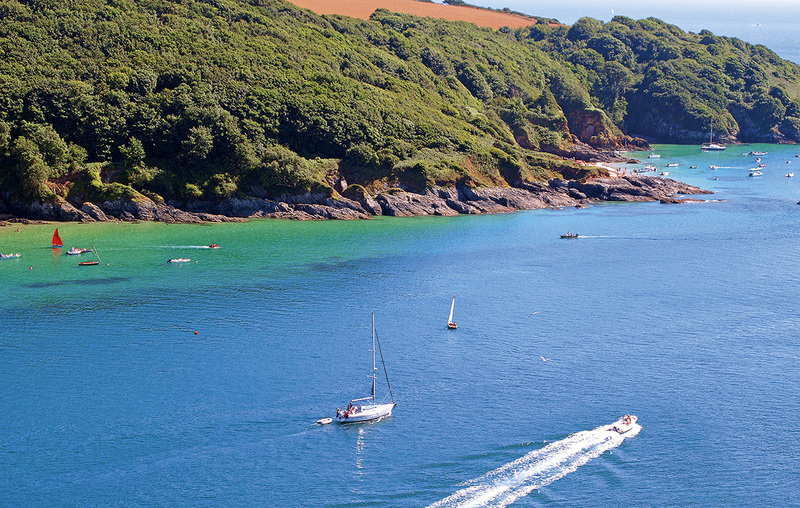 The south coasts of Devon and Cornwall have some of the finest, most relaxing cruising waters in Britain, with wonderful rivers and picture-book harbours providing effortless enjoyment and few complications. The West Country has a slow pace of life, just what you need on a precious week’s holiday. Down here you can indulge in the art of pottering, spending time slowly in magical places between comfortably short passage hops. Devon and Cornish rivers are ideal for this and there is nothing to compare with meandering up the River Dart, anchoring in Salcombe Estuary (pictured above) or simply lazing on deck and gazing around in sleepy Newton Ferrers or bustling Fowey. 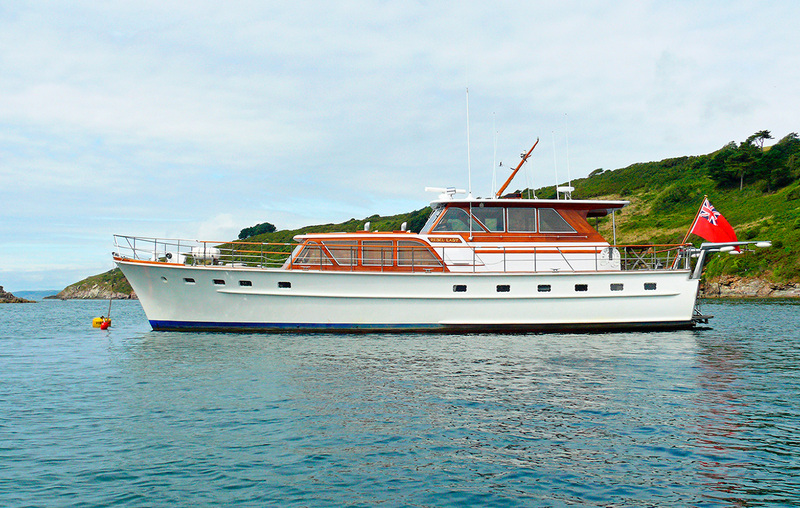 The 60ft classic Rebel Lady has just the right leisured style for West Country cruising. Based at Dart Marina, this impeccably maintained Van Lent motor yacht has a strong, seaworthy steel hull, opulent teak superstructure and the elegant accommodation you would expect from her renowned Dutch builder. Powered by two 120hp DAF diesels, she is stabilised by Vosper fins and is quiet and comfortable at sea. While her charters are all skippered, more experienced parties can join in the cruising and effectively become the owners of this aristocratic ship for a week. You join Rebel Lady (pictured below) on a Sunday afternoon and aim to be back at Dart Marina in time for Friday sundowners. The first day’s treat is cruising at easy displacement speed around the sweep of Start Bay. You pass Blackpool Sands, fringed with pines like a slice of the Riviera, and then the two-mile beach at Slapton curving out towards Start Point. Arriving at Salcombe is a million-dollar experience as you turn in past Sunny Cove beneath prosperous residential slopes. In the Yealm you lie alongside a snug pontoon with views around the miniature wooded estuary and Newton Ferrers’ jumbled village. Plymouth Sound is another great day, a naval roadstead with a colourful past and then the Tamar River gliding inland past old dockyards and secret creeks. 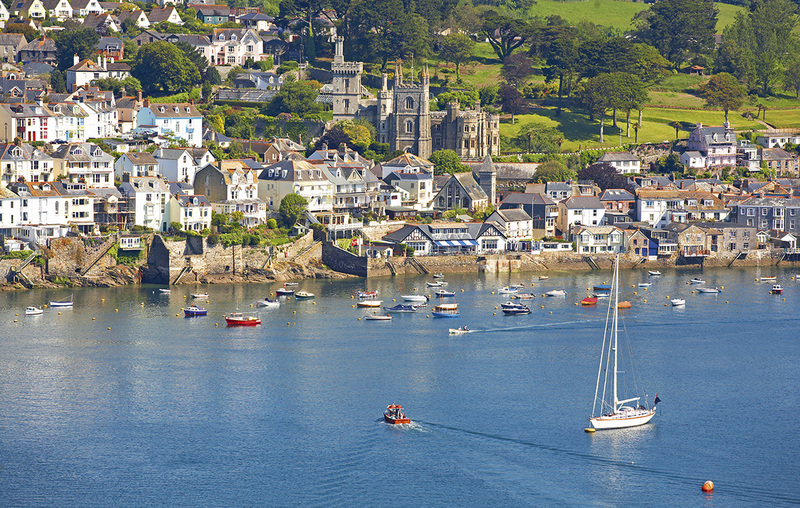 Further down into Cornwall, Fowey (pictured below) is a gem, invisible from seaward except for a melodramatic red-and-white daymark high on Gribbin Head. The entrance is narrow between two ruined forts before the wide harbour bight opens out as if by magic. Friday evening is a crowning finale as Rebel Lady slips into Dartmouth’s steep-sided valley past fantastic layers of houses climbing above the river. Up ahead, Britannia Royal Naval College stands proudly in its rolling green acres, one of England’s most evocative maritime vistas. Guide prices: £4,850 for a five-day charter including skipper and fuel. Getting there: Dartmouth is 17 miles drive from the A384 (Buckfastleigh) exit of the A38 Devon Expressway. By rail it is 3hrs from Paddington or Birmingham to Totnes station, then a half-hour taxi ride (14 miles) to Dart Marina.